The Hearts of Iron II encyclopedia. 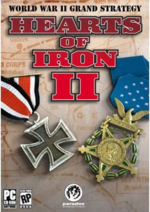 Hearts of Iron II is a grand strategy computer game by Paradox Interactive. This page was last edited on 24 July 2017, at 12:44.